If you like the idea of getting lei’d at the beginning of your wedding ceremony, then a Hawaiian wedding may be right up your alley! 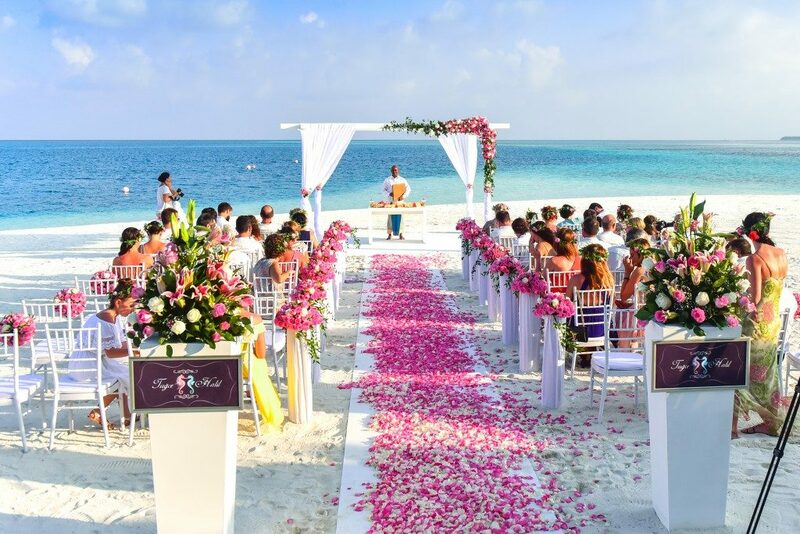 There are so many wonderful reasons to incorporate Hawaiian wedding customs into your ceremony, whether you’re getting married on the beach in Maui or in a Catholic church in Chicago. Central to the Hawaiian culture is the Aloha Spirit, which can be loosely defined as a commitment to treat oneself and others with kindness, respect and love. The traditional Hawaiian flower lei, signifies love and respect. They are worn by the bride and groom as well as members of the wedding party. Usually, there is a lei exchange between bride and groom at the beginning of the ceremony, along with an explanation of its significance. Like a wedding ring, the lei is an unbroken circle that represents your eternal commitment and devotion to one another. The beauty of each individual flower is not lost when it becomes a part of the lei, but is enhanced because of the strength of its bond. Additionally, the bride often wears a garland of flowers in her hair, rather than a veil. In traditional Hawaiian weddings, both the bride and groom wear all white, and the groom wears a colored sash around his waist. It is also common these days for the groom and groomsmen to wear aloha shirts with light colored pants; while this is not traditional protocol, it is certainly acceptable and festive island attire. Let’s not lean too far in the vacation-wear direction, though: Ladies, while island style is casual, I recommend waiting at least until the reception gets going to don the coconut bras and grass skirts. The Hawaiian Wedding Song, Ke Kali Nei Au, is usually played during the ceremony, although it would work nicely as the first dance at your reception as well. It was originally written in Hawaiian in1926 by Charles King, and has been translated into English and covered by several artists; most notably Elvis Presley in the movie, Blue Hawaii. Native to the Big Island of Hawaii, the Koa wood and Ti leaf ring blessing has a lovely meaning and is beautiful in its simplicity. Koa is a treasured and valuable hardwood that represents integrity and strength, which are foundational qualities of a marriage. The Ti leaf represents prosperity, health, and blessing of body, mind, and spirit. The officiant begins by dipping a Koa wood bowl into a body of water. The leaf is dipped into the bowl, and the water is sprinkled three times over the rings while the following chant is recited: Ei-Ah Eha-No. Ka Malohia Oh-Na-Lani. Mea A-Ku A-Pau, means: May peace from above rest upon you and remain with you now and forever. The water signifies two things: First, washing back into the ocean, symbolically, any hindrance to your relationship. Secondly, it represents a brand new beginning as husband and wife. This is another significant and beautiful part of the traditional Hawaiian wedding. The lava rock is symbolic of the moment you made a lifetime commitment to one another. It is wrapped in a Ti leaf and left at the ceremony site as an offering, prayer, and blessing which remains steadfast at the place of your marriage, marking the birth of your union, while your rings are a symbol of that commitment that travel with you wherever you go. The Hawaiians contend that when the wind stirs at a wedding, it is the presence of their Ohana (family) who are physically absent but surround you at this moment with their love, support, and blessing. This draws attention to the dearly departed with its explanation and can serve as a pleasant and casual reminder throughout the ceremony. This method is most prudent if you’re having an outdoor ceremony or using a temperamental fan.